For a brief history of the Little Bird, the 160th Special Operations Regiment (SOAR), and/or Kitty Hawk's previous Little Bird (AH-6J/MH-6J), look here. 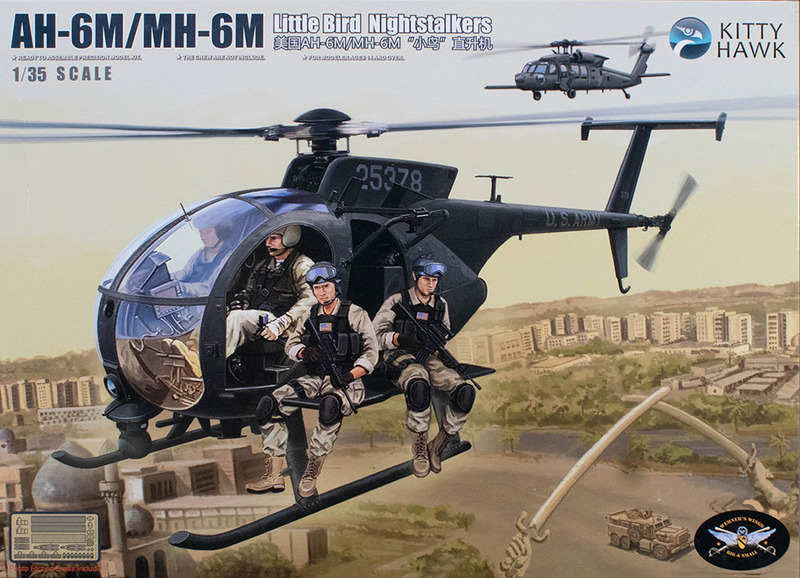 A little over a year ago, Kitty Hawk released their AH-6J/MH-6J Little Bird kit, which were the versions that took part in operations over Mogadishu as well as a number of other special operations and in support of Operation Iraqi Freedom. This release covers the contemporary AH-6M/MH-6M MELB Little Bird and this is the one I've been waiting for! 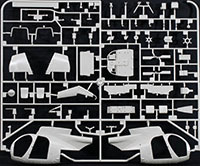 Like the prevous release, this kit is molded in light gray styrene and presented on three parts trees, plus one tree of clear parts, and a fret of photo-etched details. Unlike the first release, this kit offers five resin figures in the box (Kitty Hawk did reissue the AH-6J/MH-6J with different figures last year). While two of the parts trees are common with the previous release, the first tree at the top is completely new. If you compare the photo with the fuselage tree from the last kit, you'll see that the fuselage, tail, rear cockpit bulkhead, and more are different to capture the essentials, not the least of which are the six-bladed main rotor head and dual tail rotors. As previously mentioned, this kit comes with a set of nice resin figures to set up a nice vignette or part of a diorama. The figures include one seated pilot, one standing pilot, two special forces troops standing by while a third special forces figure is carrying a wounded comrade back to the aircraft. These are not the same figures included in the re-release of the AH/MH-6J kit, so if you have that kit, you can mix and match the figure sets as you'd like. This kit looks as nice as their previous release and should build as nicely. If you'd like to see our quick-build of the AH-6J/MH-6J kit (no paint or filler), look here. If you love black ops subjects like the Little Bird, you'll also want to find a set of Werners Wings 1/35 Night Stalkers Part 1 and Night Stalkers Part 2 decals that also provide additional information useful for building an accurate Little Bird for a specific time/mission period. Coming next from Kitty Hawk in this series are a number of H-60 aircraft in 1/35, including the MH-60L, HH-60G, HH-60H, and SH-60F. With all of the engineering done with their 1/48 UH-1 Huey series, let's hope that we'll see these in 1/35 scale as well!